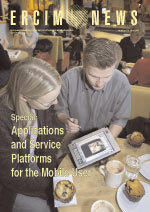 SpaRCIM, the Spanish Research Consortium for Informatics and Mathematics, joined ERCIM on 1st July 2003. Rey Juan Carlos University (URJC). These institutions include a number of groups that are considered to be representative of Spanish research in computer science. These groups are working on a great variety of research areas within information technology and applied mathematics. 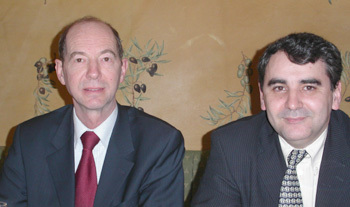 ERCIM President Gerard van Oortmerssen (left) and SpaRCIM's representative on ERCIM's Board of Directors, Juan José Moreno from the Technical University of Madrid and the Spanish Ministry of Science and Technology. The IIIA is a centre devoted to research in Artificial Intelligence (AI), and belongs to the Spanish Scientific Research Council (CSIC). The IIIA was created in 1985, and currently has around thirty members. Topics of research include learning systems, intelligent agents, logic reasoning and search, electronic marketplaces, autonomous robots and music with AI. Intensive collaborations, mostly within the framework of European community programs, have taken place with industries and academic institutions in many countries. The UMA was created in 1972, and thirty years later, it plays an important role in the cultural life and the scientific, economical and technological development of the local region. The participation of the UMA in SpaRCIM is currently managed by researchers from the Departamento de Lenguajes y Ciencias de la Computación (LCC). Research focuses on various aspects of software engineering in the field of distributed systems, and in particular, specification and design methodologies and open and heterogeneous systems. The objectives are to study (and deal with) the basic problems of these techniques and systems, and to develop applications which can be supported by them, including telecommunication services, telematic applications, electronic commerce etc. The UPC was created in 1971 and is one of eleven universities in Catalonia. Almost all technical fields are taught at the faculties and technical schools of the UPC and in addition, the UPC provides academic supervision to a number of associated schools and hosts several research institutes. The participation of the UPC in SpaRCIM is currently managed by researchers from the Departament de Llenguatges i Sistemes Informàtics (LSI), which is composed of more than 180 people. Topics of research include algebraic foundations of system specification and design, logic in computer science (automated deduction, term rewriting etc), natural language processing, machine learning, autonomous agents etc. While the UPM was created in 1971, most of its integrated centres have a long history dating back to the eighteenth and nineteenth centuries. The schools of engineering and architecture are the oldest in Spain, and became part of the UPM after its foundation. The participation of the UPM in SpaRCIM is managed by researchers from the Departamento de Lenguajes y Sistemas Informáticos e Ingeniería del Software (LSIIS). Topics of research include design, semantics, implementation, applications of declarative programming and specification languages, distributed execution, the Internet and World Wide Web, enviromental software and modeling, global program analysis, programming language design, program transformation/optimisation and parallelism. The UPV, founded in 1971, is a dynamic, innovative public institution dedicated to research and teaching, which maintains strong bonds with the local community and simultaneously has an important presence abroad. The participation of the UPV in SpaRCIM is managed by researchers from the Departamento de Sistemas Informáticos y Computación (DSIC), which comprises more than 150 researchers, staff and graduate students. Topics of research include computational logic, databases, formal methods in software engineering, multi-paradigm programming, natural language processing, object-oriented conceptual modeling and databases, object-oriented methods for software development, WWW engineering etc. The URJC in Madrid was created in July 1996 at the behest of the government of the Comunidad de Madrid. Its medium-term goal is to achieve a balance between supply and demand for university resources in the region, thus complementing existing universities and enriching the students individual and social opportunities. This public university is located in the southern area of the Comunidad de Madrid, and its faculties include Experimental Sciences and Technology, Health Sciences, Communication Sciences, and Law and Social Sciences. 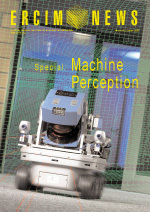 Topics of research relevant to SpaRCIM include image processing, neural networks, object-oriented databases, security etc. These institutions already collaborate in a number of European networks and projects such as NAME, CoLogNet, AgentLink and PROENBIS. They also collaborate in a number of national networks and projects funded by the Spanish Ministry of Science and Technology (MCYT), and have founded a number of spin-off companies. The consortium is open to other Spanish institutions. The members of SpaRCIM are interested in sharing experiences and developing coordinated projects in areas related to software technology. They expect to actively participate in the current working groups, and to promote new research in other fields of competence. There is also interest in reactivating, where possible, former working groups such as 'Programming Languages Technologies' and 'Database Research'. Regarding SpaRCIM as a member of ERCIM, Prof. Juan José Moreno from the Technical University of Madrid (UPM) and the Spanish Ministry of Science and Technology (MCYT) is heading the ERCIM activities at SpaRCIM. Prof. Ernesto Pimentel from the University of Malaga (UMA) is the corresponding member of ERCIMs Executive Committee.